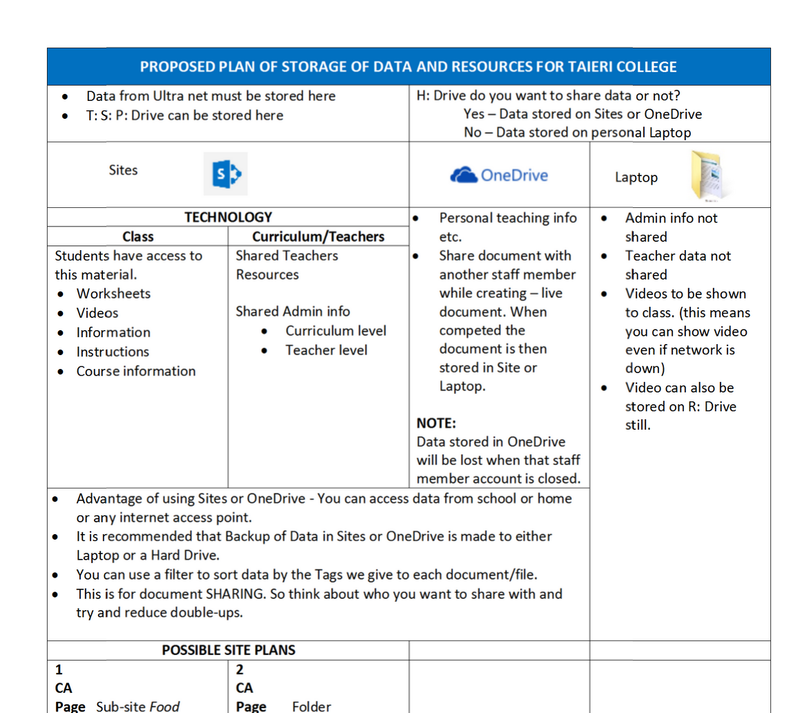 Just over a week ago I briefed the curriculum directors at my school about Sharepoint Sites and the plans we have outlined to use Sharepoint for our document sharing and storage. 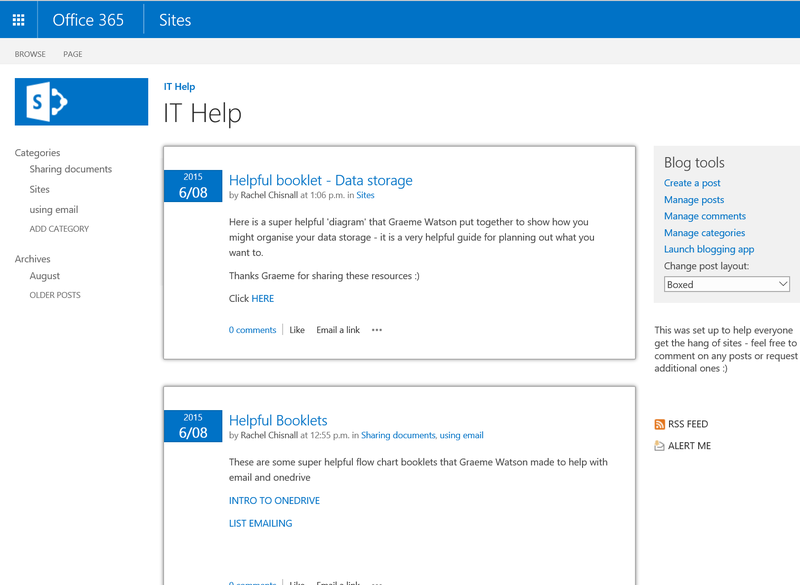 I set up a subsite for each curriculum area and asked them to talk about it with their curriculum areas, with a focus on what documents that would like to store on the sharepoint sites. The directors went away to talk to there various departments around working out some plans and how they wanted their sites to look. Another timely reminder that teaching adults (especially teachers) is very different from teaching ‘teenagers’. I have been thinking about this a while, and have talked about it with some different people who are also leading some professional learning in their schools – and I simply LOVE this blog post from @AKeenReader. So much for the specific instruction of lets stick with doc to start. All of the departments have flown off in different directions and speeds. It is great though, as we are making more progress than I had hoped for. It does mean I have been rushing round like a mad thing getting pulled in all sort of directions, but seeing the results has been fantastic. 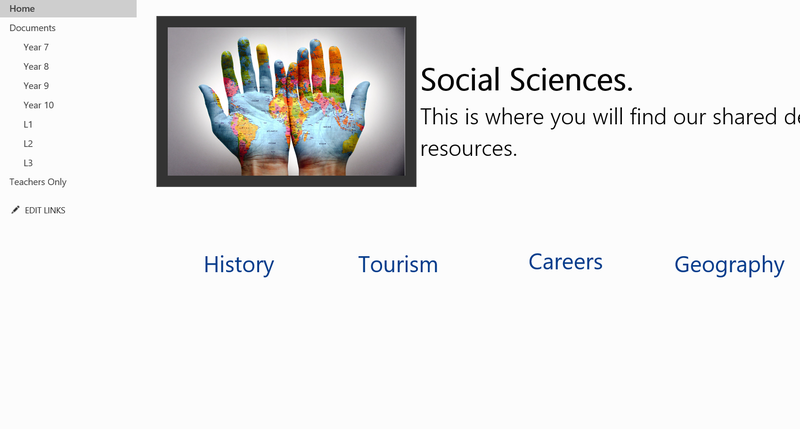 This isn’t docs – but subsites for different ‘branches’ of the social sciences which are linked in to their home page. Each department wanted it’s own page. 2. I have started a blog to try and help staff get their heads around the important bits they need to do. Office Mix has made this so easy, just a few simple bullet points and screen capture and away we go. Staff are finding this easier than the youtube clips, as it is specific to our environment. I’m also adding mixes as I make them – I’ve made this one on basic site editting, and the next plan is for one on the differences between sub sites and pages. 3. We have made a call and are going to house all of the student documents on a separate site collection. While I am getting more confident managing site permissions etc, having them in a separate site collection means less chance of documents being shared accidentally. It does add another layer of complexity for staff though, and we have laready had some challenging discussions around where each document should go, but we are trying to clarify it with staff sites for admin, student sites for teaching resources. Hopefully we get it right. 4) less about sites and more about ‘data management’ – we are slowly getting around some of the initial confusion and mistrust of the shared document idea. Some areas are persisting with folders, while others are embracing the meta data idea. At this stage, if people want folders, we are building folders as it is better to get people up and using it. I am going to learn how to make these folders ‘searchable’ so the tagged documents still come up on different views. The linear data storage is very entrenched in the “teachers drive” mindset and I have to remind myself to be more respectful of the need for organisation in this way – even if it isn’t my own way of thinking. So, all in all, it has been a much smoother process than I could have hoped for. My next steps are getting the student portal into some sort of workable shape and designing a ‘class’ page template. As well as making sure the Curriculum areas are getting what they need to progress. Next Post Why don’t we talk about job applications…..?? Really interesting post, our school is undergoing a similar process at the moment. Thanks.